Last month, I saw a deal offering at one of the top-selling groupon sites, Ensogo. P80 for a large-sized yogurt with 3 toppings regularly valued at P160, I'm sold! Although I love the sweet and creamy traditional ice cream, there's no doubt that I also fancy the tart and tangy low-calorie, non-fat frozen yogurt. They're not as good as my sweet desserts, but offers cold and refreshing confections minus the guilt. 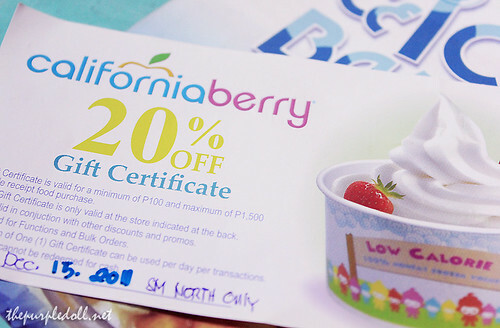 After a hearty dinner at Gumbo last Tuesday, my date and I followed it up with a trip to California Berry to consume our Ensogo vouchers. The transaction was hassle-free and the staffs were all friendly. Overwhelmed with the topping choices ranging from fruits, dried nuts, chocolates, candies and other goodies, I just opted for their pre-made selection and ordered the California Berry Special which is plain yogurt with mangoes, strawberries and kiwi. 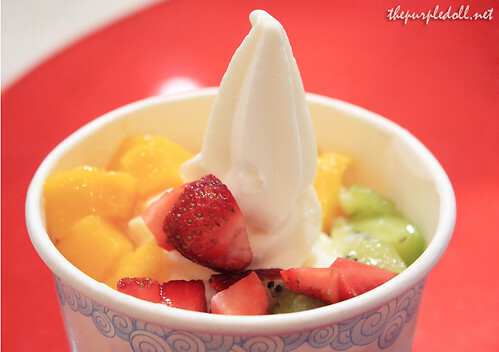 As expected, the tartiness of the frozen yogurt greeted my taste buds, coupled with the sweet and tangy fruit toppings. I love how the fruit toppings came in a generous serving, unlike other frozen yogurt stores who give pretentious serving of add-ons. Their fruit toppings were also fresh. My date on the other hand, had let his flavor-imagination go wild and concocted his own frozen yogurt mixture. Not being too fond of frozen yogurts, he wanted to coat the froyo with chocolatey goodness, so he got some oreo, choco bits and almonds in his large-sized plain yogurt. His froyo order was a lot sweeter than mine. 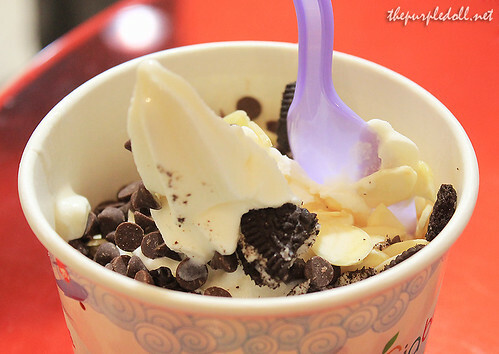 The oreo's sweetness and crunch blended nicely with the tart yet creamy yogurt. The choco bits, along with the almonds also added more sweetness and texture. We weren't able to finish our large froyo cups within the store, so we decided to head out and just bring our cups along. (We love walking while eating!) But even before leaving their doors, California Berry's supervisor went up to us and gave us a 20% off Gift Certificate. She told us that this is California Berry's current promo -- a 20% off GC on your first visit, and upon using that GC, you'll again be entitled to a 10% discount on your next purchase. Sweet! Although frozen yogurt is not as satisfying as ice cream, it's the guilt-free branding that makes it a hit. More so, a cozy and nicely decorated store, coupled with good customer service, will make customers come back again and again. Just like in California Berry's case. Ang hilig mo sa group deals!!! froze yogurt i liked i liked..